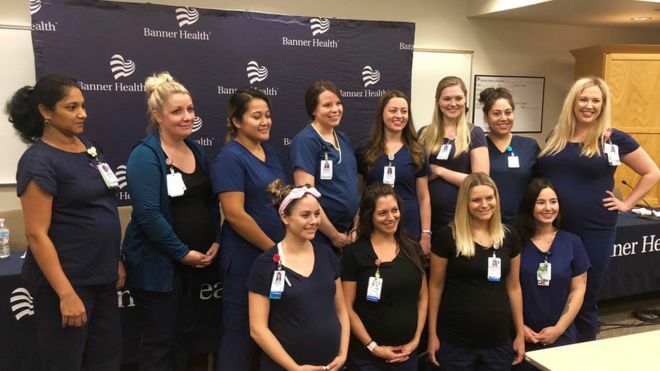 A group of 16 nurses working in the intensive care unit (ICU) of Banner Desert Medical Centre in Mesa, Arizona have astounded co-workers by all becoming pregnant at the same time. The nurses only discovered how many of them were simultaneously expecting children when they all happened to join a Facebook group chat for pregnant workers at the hospital. Ms Atkins explained to CBS-affiliated TV station KPHO-TV how the discovery has brought the nurses closer together. “This isn’t an easy job to have when you’re pregnant and not feeling well all the time, so it’s nice to share stories and have that support, and then you find out how supportive your co-workers are of you, and your management team, so it’s been a good experience,” she said. Most of the nurses are due to give birth at some point between October and January. While some may think that the absence of the nurses after they give birth may cause complications for the ICU, the hospital is well-prepared for the eventuality. “We’ve been planning this for months, so we feel very confident that we’re going to have plenty of ICU nurses to take care of patients,” explained Heather Francis, nursing director at the hospital. While the nurses will continue working as long as they can throughout their pregnancies, there are certain precautions that they now have to take in order to look after the health of their babies.